Successful retirement planning is about managing your money to make the most of your retirement years. Given the current economic uncertainties about the stock markets, housing costs, pensions and interest rates, however, many of us are questioning our retirement targets. Add to this the “hidden” realities of retirement, namely longer life expectancy and future health care costs, and it’s no wonder most of us are concerned. 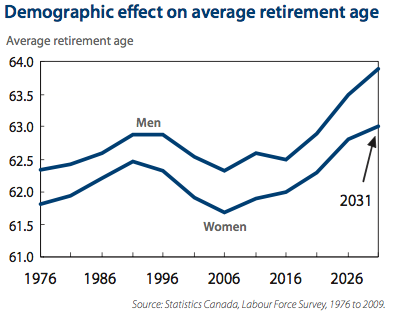 Even the traditional age of retirement is changing. Mandatory retirement at age 65 is becoming a thing of the past, with the government recently delaying the onset of Old Age Security payments to age 67. Why? The answer is sheer demographics. The original Old Age Security plan was designed to fund an average 15-year retirement. Yet life expectancy in Canada increased by 30 years in the 20th century, with the average life expectancy now between 90 and 100 years. Although that’s great news for us, the current programs cannot adequately support a retirement of 25 or 30 years. In addition, many of us could end up with a lot less money for retirement than expected because our investment plans are based on projected rates of return that are now far out of step with reality. The expected rate of return is a crucial piece of any retirement plan, because it sets the expectation for how much a portfolio will grow and what it will ultimately be worth when a person is ready to retire. There was a time not so very long ago when a well-diversified portfolio made up of a mix of equities and fixed income investments was expected to comfortably earn a long-term average of 7–8% a year. That projection was based, in part, on the long-term returns of stock and bond markets in decades past. In 2013, however, the world economy is wrestling with an outlook that the head of the International Monetary Fund has described as “quite gloomy.” Interest rates are already at all time lows and can’t fall much further. Long-term bond yields are also at historic lows. It’s time for investors to be more realistic when projecting long-term returns. The challenge is how to adequately save for a potentially long retirement and how to turn your assets into sustainable income once retired. At Leon Frazer, we carefully examine the day-to- day trends that impact your investments, but as always, we remain focused on the long-term. Inflation remains the key hurdle to a successful retirement. If annual inflation averages 3%, for example, in just 10 years time, you will need to withdraw 30% more money, or more than $13 from your retirement nest egg to purchase the same goods and services that cost $10 today. And much more disturbing, in 20 years, you will need to withdraw 80% more, or $18 to make that same $10 purchase. That’s why taking steps to combat inflation is essential when planning for your future. The Leon Frazer strategy of investing in good quality, dividend-paying stocks with a history of increasing returns offers a proven record of inflation protection through capital appreciation and growing dividend income. We reinvest the dividends to take advantage of the power of compounding returns. This means you have access to a constant, reliable stream of income, even in your retirement years. This articles first appeared as the Spotlight article in the LFA Quarterly Review Q4, 2012.